Excellent Rock 'n' Roll band for hire. Playing classics covers of the 1950s and 60s including Elvis, Buddy Holly, Bill Haley, etc. Excellent Rock ‘n’ Roll band playing classics covers of the 1950s and 60s including Elvis, Buddy Holly, Bill Haley, etc. Good Rockin’ Tonight have, in a few years only, established themselves as the UK’s No.1 Rock ‘n’ Roll show, and cause a sensation wherever they appear. Fronted by the very talented and dynamic Mark Keeley (lead vocals/guitar), they have gone from strength to strength since their original appearance on Sky TV, which led to their national TV debut in 1994. Other TV appearances have since followed, with the National Lottery being their most recent TV showing. This classy, fully professional four piece group features the amazing talents of John O’Malley (vocals/lead guitar, regarded by fellow musicians as one of the finest guitarists around today), Jason King (vocals/double bass) and Dan Church (vocals/drums, known for his spectacular Wipe Out solo). 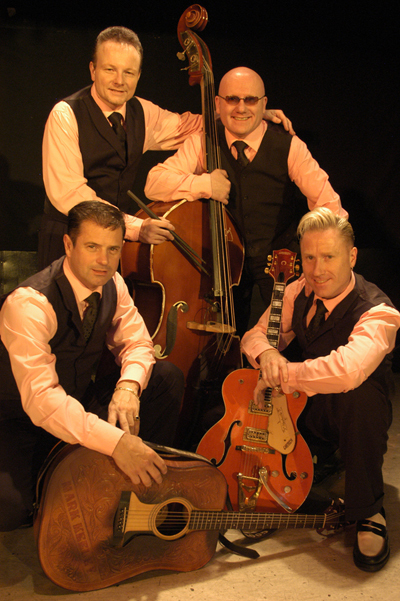 They have captivated audiences up and down the country, and abroad, with their comprehensive range of rock ‘n’ roll music which includes commercial, rockabilly, three part harmonised doo wop and even a few of their own compositions. They have supported many of today’s big name attractions, including Bill Haley’s original Comets, Marti Wilde, Buddy Holly’s Crickets, The Drifters, Joe Longthorne, Showaddywaddy & Freddie Starr. Good Rockin’ Tonight have appeared at many top line venues including The London and Coventry Hilton Hotels, Butlins, Haven-Warner, The Dorchester Hotel – London, Chicago Rock Caf’s, and are one of the front line bands on the Brannigans circuit. This young, vibrant band is in constant demand on the military circuit both in the UK and abroad. They regularly tour such countries as Spain, Germany, Greece, Holland and Israel. They have recently finished a very successful cruise to Spain. This sensational spectacular is adored by every age group which makes it ideal for theatre, TV, hotels, cabaret, corporate and private functions everywhere. Bookers and promoters far and wide are choosing Good Rockin’ Tonight as they are assured of first class professional entertainment and, in the words of the critics, ‘musically and visually stunning … pure excitement … they’re in a league of their own’ (The Stage). They have released 15 CDs to date, including a Christmas album. They also have a following in nearly every part of the UK and many European countries. The band has a state-of-the-art, 4k public address system and full light show to match, and are one of the hottest acts on the scene today. Definitely a show not to be missed. Until you’ve seen Good Rockin’ Tonight, you’ve not seen where Rock ‘n’ Roll is at in the 21st century! 15/9/07: We wanted to write to you and say that you really helped make our wedding day. The band were very professional in every way and all our guests loved the band. We have had so many compliments. Thank you’. Pat Salmon, Essex: Thank you for another great night of Rock ‘n’ Roll at Pakefield, Pontins, the band was ELECTRIC tonight!! !